The United States Conference of Catholic Bishops released their eleventh annual report on the progress of implementing the Charter for the Protection of Children and Young People as part of the effort to increase transparency with regards to sexual abuse. The 2013 audit was carried out by StoneBridge Business Partners, which collected data from 127 dioceses/eparchies between July 1, 2012, to June 30, 2013. The healing of victims/survivors of abuse remains our first priority. We join Pope Francis in his desire that the response of the Church be pastoral and immediate. This year’s report reflects our pledge to address the sexual abuse of minors through comprehensive efforts to reach out to victims with care and compassion, a commitment to report all abuse to the authorities, accountability for those who have committed acts of abuse, and strong efforts in education and prevention. This report is part of a pledge we have made to remain accountable and vigilant. Behind the data contained in the report are men and women, adults and children, in need of our prayers and support. As we continue to create a climate of safety for all minors entrusted to the Church’s pastoral care, our three-fold pledge guides us: to help victims heal; to educate about and prevent abuse; and to hold accountable those who have harmed children. These remain essential priorities for our Church. 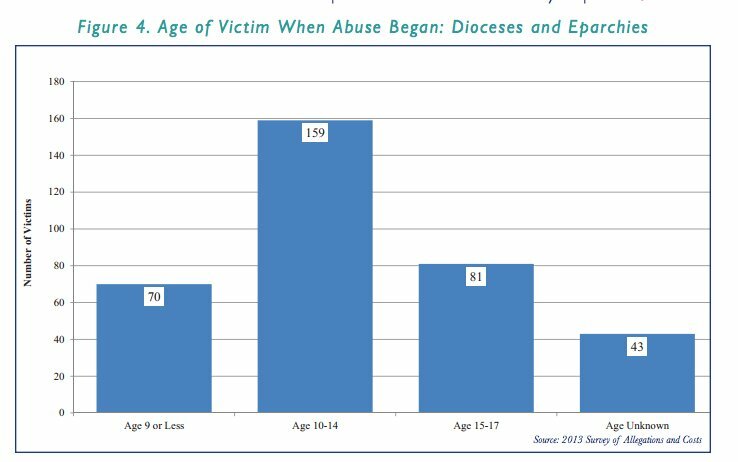 Between July 1, 2012, and June 30, 2013, 857 people came forward in 191 Catholic dioceses and eparchies to make 936 allegations of sexual abuse. 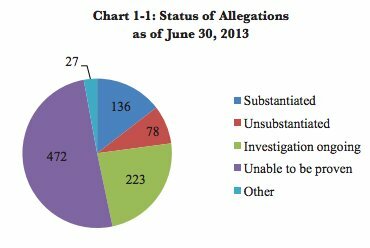 As of June 30, 2013, 136 allegations were considered substantiated, which means that enough evidence was found to prove that abuse occurred. 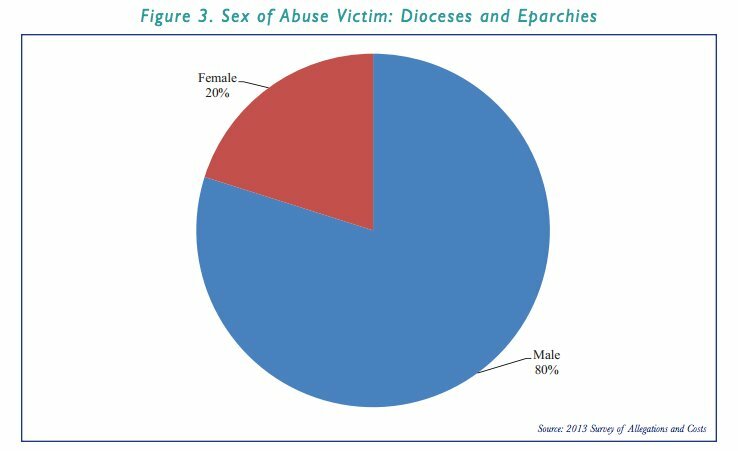 538 of those accused were priests, of which 382 were diocesan priests, 110 belonged to a religious order, and forty-six had been incardinated elsewhere. 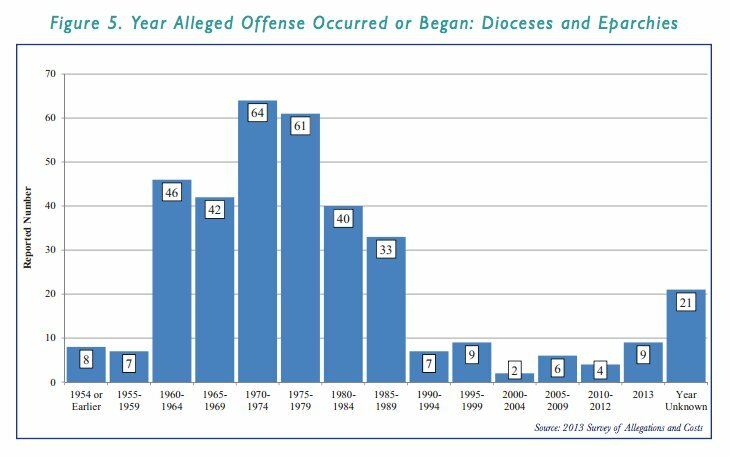 Eleven deacons were accused, and 175 accused were of an unknown clerical status. 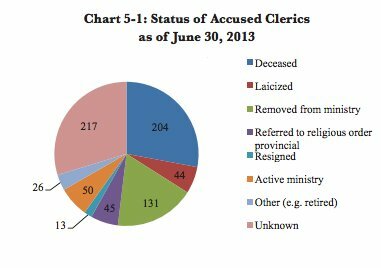 204 clerics out of the 730 accused are have already died. Though the allegations were all recorded in the audit period, some of them reported abuse that had occurred from the 1920s to the present day. Out of the 365 alleged victims, 286 were male, seventy-two were female, and the gender of seven of the victims was not reported. 159 victims out of 365 were between age ten and fourteen when the abuse began. 125 instances of abuse reportedly occurred between 1970 and 1979. 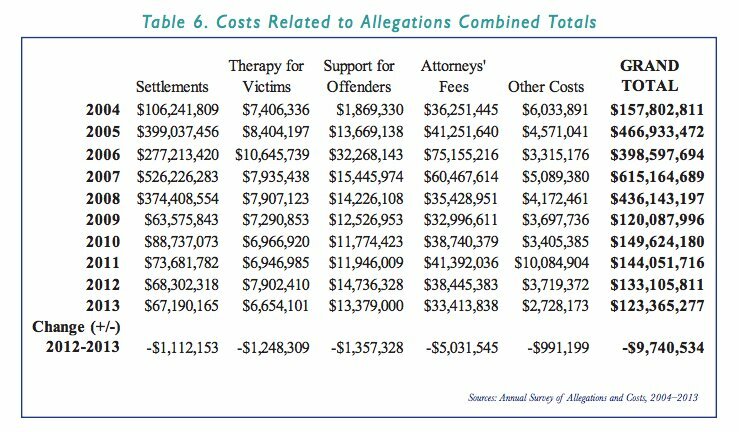 Between 2004 and 2013, the Church spent a total of $2,744,876,843 in costs related to abuse allegations, which includes settlements, therapy for victims, support for offenders, attorneys’ fees, and other costs. These figures represent individuals who have been background checked at least once. The Diocese of Lincoln, the Chaldean Eparchy of Saint Peter the Apostle of San Diego, the Eparchy of Our Lady of Nareg in New York for Armenian Catholics, and the Ukrainian Catholic Eparchy of Stamford were all found to be noncompliant with the terms of the Charter due to their refusal to participate.